This article will introduce the MICCA pilot project in Kenya in the East Africa Dairy Development Project (EADD) in Kaptumo, where smallholder dairy farmers are integrating climate-smart practices into their farming activities. The East Africa Dairy Development Project (EADD) is a regional industry development program implemented by Heifer International and a consortium of partners including TechnoServe, International Livestock Research Institute (ILRI), The World Agroforestry Center (ICRAF) and African Breeding Services (ABS TCM). The project is funded by the Bill & Melinda Gates Foundation as part of an agricultural development grant designed to boost the yields and incomes of millions of small farmers in Africa and other parts of the developing world so they can lift themselves and their families out of hunger and poverty. 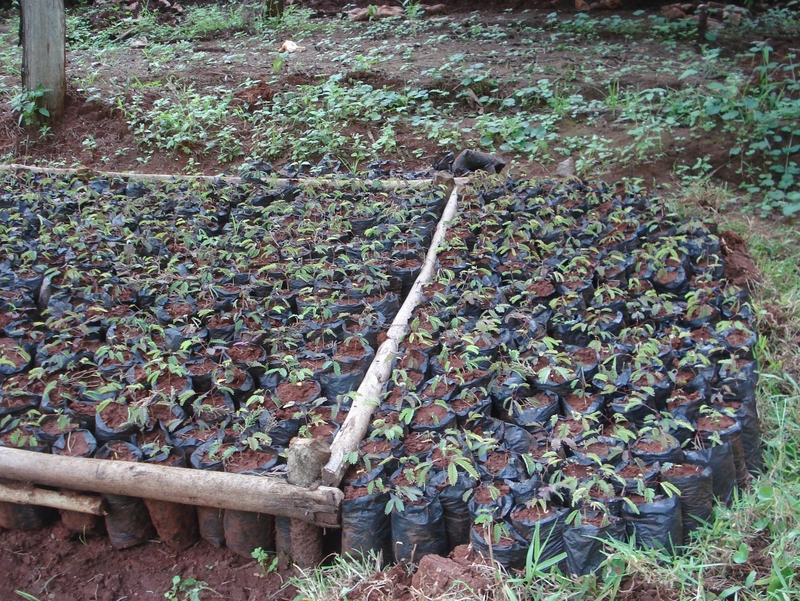 The EADD Project is implemented in Kenya, Rwanda and Uganda. 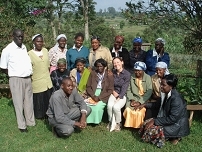 In Kenya, 21 farmer organizations have been established since 2008 and work through a ‘ hubs’ model. These hubs provide services such as chilling plants, storage, agro-veterinary services, and artificial insemination services among other services. MICCA has partnered with EADD in Kaptumo in Nandi South District in the Rift Valley Region, where a chilling facility is located in Ndurio (5,000 l tank) and in Kaptumo (10,000 l tank). The hubs are managed by the Dairy Farmer Business Associations (DFBA), who are shareholders. The majority of the farmers practice mixed farming; they grow crops and keep livestock. Maize is the main staple crop in the area, as well as beans, bananas and tea. Some farmers also plant Napier grass. About 40% of the farmers are able to provide food for the whole year from their own production (Zagst, 2012); moreover maize yields have been declining by more than 50% over the past years (Wambugu and Franzel, 2012). Many farmers are also replacing maize with tea, as the price for this cash crop is increasing, and provide a constant income source. The majority of farmers own dairy cattle, as well as some chicken. The EADD project is supporting the farmers increase milk production by intensifying the production, which means reducing the number of cattle per household and improving productivity through artificial insemination and nutritious feeding. As the land is very densely populated, the free ranging of cattle has become limited. The smallholder farming systems in Kaptumo are characterized by low land and livestock productivity due to unreliable and inadequate rainfall, infertile soils, poor agronomic practices, undeveloped marketing channels and lack of agricultural inputs (Wambugu and Franzel, 2012). According to the socio-economic baseline survey, conducted in 2011 in the area, farmers are aware of the effects and impacts associated with climate change, which are mostly associated with variations in rain patterns. They experience frequent droughts, excessive rains in the wet season and subsequent crop failures and decline in livestock productivity which increases their vulnerability to food insecurity and poverty (Zagst, 2012). To quantify the impact the climate-smart agricultural practices have on climate change mitigation and on farmers’ net welfare and well-being, as well as on land health. Support the uptake of fodder shrubs and herbaceous legumes into mixed farming systems to increase dairy productivity and eventually reduce number of dairy cows per household. Inform about zero-grazing for manure management and installation of biogas unit for suitable farmers. Awareness raising on climate change. Exploring local solutions and mechanisms for climate change mitigation and adaptation, such as group/commercial tree nurseries and manure management for composting or biogas production. Water storage and harvesting for livestock use. 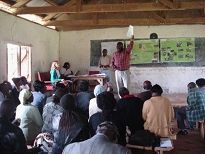 The project conducted rapid rural appraisals with two dairy groups to identify, list and rank climate-smart agricultural practices that they thought would be important for their area (Wambugu and Franzel, 2012). The lists of practices mentioned in both villages looked very similar: better feeding and improved husbandry were mentioned as very important, as well as agroforestry practices by increasing on-farm tree planting and reducing the rate of deforestation. Other practices mentioned were improved manure management and composting, energy-saving cooking stoves, biogas unit installation, conservation agriculture, and installation of solar energy devices. Technical stakeholders and project staff have been organizing trainings for the CESPs and the farmer trainers. The topics included in the training covered the basics of climate change and mitigation, climate-smart agriculture and climate-smart practices: agroforestry, conservation agriculture as a combination of agronomic practices, e.g. minimum tillage, use of cover crops, etc., all aimed to promote minimum soil disturbance, permanent soil cover and crop rotation. Another topic was the establishment of high value fodder crops and forages for livestock. The farmer trainers and CESPs then replicated the training with 20 farmer groups or dairy management groups which have memberships of 15 to 60 people. The groups cover all locations from the Kaptumo, as well as neighboring Ndurio division. The trainings were followed up by a workshop to review and agree on the menu of practices with 60 farmers, which finally included use of improved fodder practices to increase dairy productivity, planting of agroforestry trees, manure management, use of biogas technologies, good cropping practices like conservation agriculture, use of energy saving stoves, restoration of degraded pastures, and protection of wetlands. Quantifying greenhouse gas emissions and the mitigation potential of smallholder agricultural activities presents a variety of conceptual and methodological challenges. MICCA, jointly with ICRAF, is adapting analytical tools and procedures to protocols, which are contributing to the development of standards of practice. These protocols form the scientific basis for estimating the global warming potential of smallholder systems and improve the comparability of data across future research activities. To characterize the soils, vegetation, livelihoods, and climate impacts of agriculture and agricultural intensification in a given landscape, ICRAF applies a set of analytical tools. For the monitoring of soil emissions of greenhouse gases spectroscopy and gas chromatography are being used. The land health surveillance utilizes advanced laboratory techniques to analyze soils properties, also involving spectroscopy. By using a statistically robust sampling design and advanced analytical tools to characterize the soils and vegetation of a region, the research carried out through MICCA pilot projects produces a biophysical assessment that establishes the condition of the resources base at the landscape level. The assessment of landscape health includes indicators on key ecosystem functions including: greenhouse gas emissions, erosion control, soil fertility and soil carbon content. Baseline measurements form the basis of an evaluation framework that can be repeated to monitor degradation and the effectiveness of rehabilitation. Measurements of the baseline conditions and assessments of intervention options are correlated to poverty factors such as income and productivity. The result is a quantitative diagnosis of the constraints to enhancing food security and improving soil, plant, and livestock health in the target region. The EADD program promotes the intensification of dairy systems to raise milk production and farm incomes. Intensification in dairy production generally involves keeping animals in stables, where they can be fed higher quality feeds and manure is collected and managed. The project has classified the dairy systems in Kaptumo into grazing, semi-zero grazing, and zero grazing, representing an intensification gradient. ICRAF developed a comparison of three farms, where each farm represents a typical farm at one stage of the intensification transition and uses this to provide evidence on the emissions for these different dairy systems. 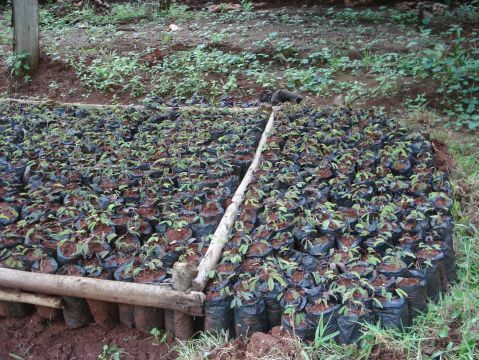 Agroforestry practices have a great potential for climate change mitigation and adaptation. Carbon is sequestered by the trees, improving the overall greenhouse gas balance, and the resilience and adaptive capacity of the agro-ecosystems is increased, lessening the risk of certain threats through for example the alteration of the micro-climate and reducing the impact of extreme weather events on crop production. Agroforestry systems also allow for diversified production opportunities which can reduce risk under a fluctuating climate (Schoeneberger et al, 2012) and allow to also diversify and increase farmers’ incomes. Using leguminous fodder shrubs, which have a high nutritive value and can improve ruminants diets, can also sequester carbon, as well as improving soil fertility. Concentrates can be replaced through the forages from fodder shrubs and support an increase in milk production, which could eventually lead to a reduction in the herd sizes and consequently a reduction in methane emissions at farm level. Improved manure management and handling can allow to reduce the loss of nutrients through vaporization, reducing methane and nitrous oxide emissions. Furthermore, the anaerobic treatment of manure through the installation of biogas units allows to produce biogas which provides energy for household cooking and lightening. The slurry from the treatment unit is a good soil fertilizer. Again, this activity allows to reduce and avoid greenhouse gas emissions, through energy savings, reductions of methane emissions, as well as an improvement in the soil fertility, boosting crop productivity. Zero-grazing can also allow for an improved manure management (Wambugu and Franzel, 2012). Cattle are an important asset for local farmers and an indicator of wealth and social status. This challenges the project approach to improve the breeds and their productivity, allowing to reduce the number of cattle families own and lessening the overall greenhouse gas balance of the livestock production systems. Therefore, long-term sensitization processes are required with respect to the environmental impact of livestock practices, as well as improving the availability of veterinary services to support artificial insemination through more productive breeds, advise on best husbandry practices in terms of food and water requirements for optimal milk production, and advice on avoiding diseases in the management of improved breeds in zero-grazing system. Similarly, the majority of households use wood as their main energy source and local heating and cooking facilities are adapted to these. Deforestation in general is on the increase, even though national programmes are in place to increase tree planting and protection. However, also the household facilities will need to be changed, causing expenses which some families might not be able to cover. Therefore, awareness activities, as well as credit systems for households to acquire new technologies, such as energy saving cook stoves and biogas units are required. Biogas technology so far has not been taken up widely because most farmers have low productive cows in extensive or semi extensive grazing systems, as well as due to high initial investment costs for the installation of biogas units and limited credit facilities, as well as a negative image farmers have of biogas linked to some failed units in the past. Additionally, there has been very limited involvement of the private sector in the development and promotion of biogas technologies in the area. Major challenges in the area are the existing poor land management practices, knowledge and information gaps and missing training opportunities on good agricultural practices, as well lack of access to agricultural inputs, tools and equipment and credit facilities. The creation of an association of dairy producers, which provides the network to build knowledge and infrastructure, exchange between stakeholders, and better link producers with the market. The involvement of farmers with extension agents to deliver and pass on training messages reinforces extension services and is important to make farmers feel empowered to be part of the training process. Linking with local community institutions when it comes to outreach to farmers is important, as these have usually good relationships with the members of the community and can report back also about problems and issues related to the implementation of practices. Improved productivity and food security are goals to be prioritized in climate-smart projects, as well as fostering the resilience of the agro-ecosystem and the livelihoods. Usually, farmers don’t perceive mitigation as a benefit nor as a priority. Therefore practices, which can boost production, while bringing both adaptation and mitigation benefits can provide local, as well as global benefits. More research is needed to showcase the synergies, but also the trade-offs for food security, adaptation and mitigation in agriculture to bring evidence forward to the national and international discussions on climate-smart agriculture. Linking research with the practical application and involvement of farmers will be required.